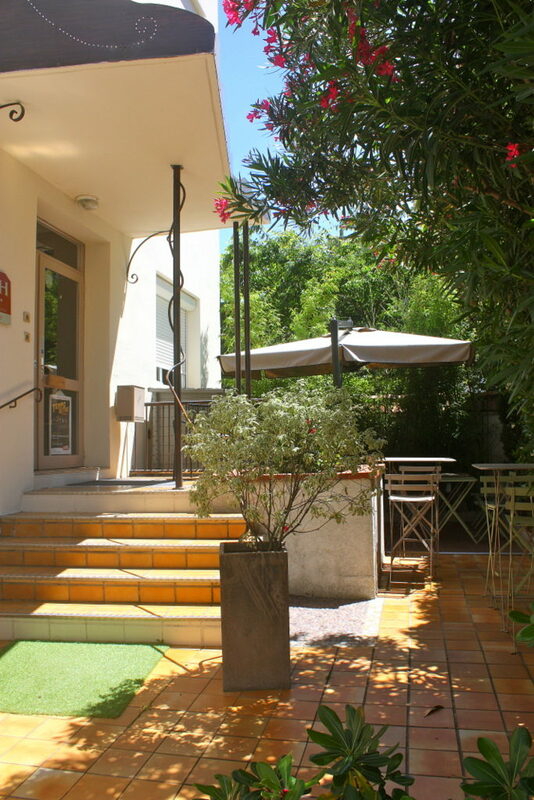 Are you looking for a friendly, affordable and comfortable hotel in a pleasant environment in Toulouse ? Welcome to the Alizé Hotel ! 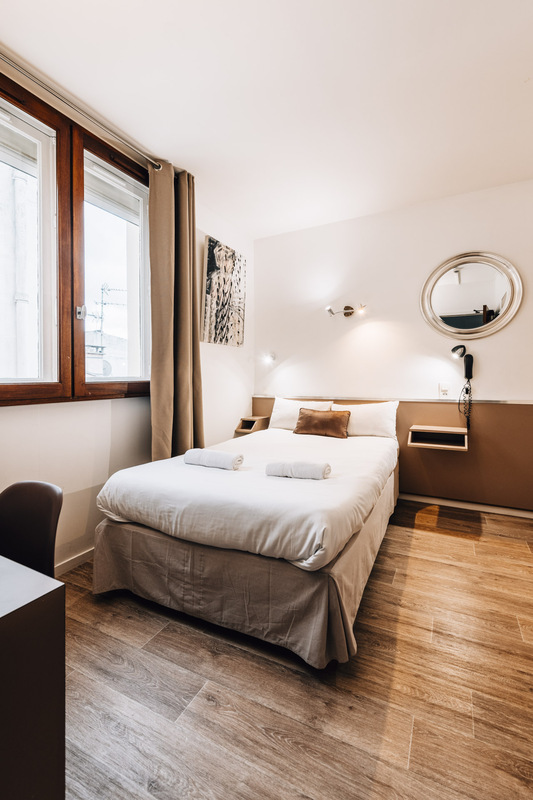 Located in a picturesque area called “les Minimes” , typical of Toulouse, where the famous singer and poet Claude Nougaro grew up, this non smoking hotel offers 17 clean and comfortable rooms. The warm welcome and service of Christophe LUCQUIN and Bertrand GILLES will ensure you have a very pleasant stay. 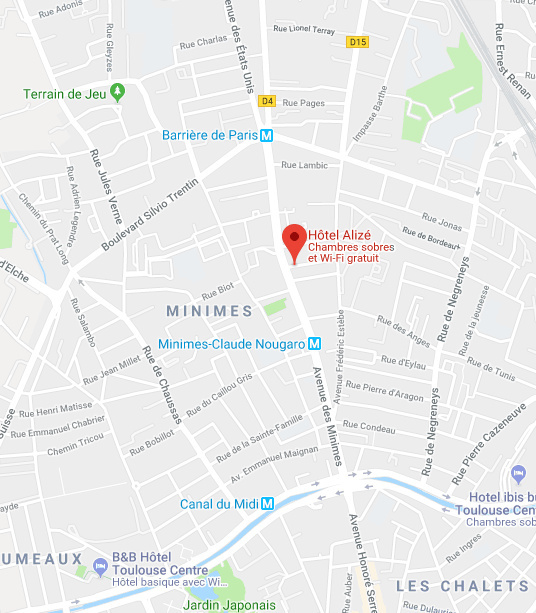 Tailored to business requirements as well as leisure activities, the Alizé Hotel is a quiet oasis in the heart of Toulouse. 10 minutes from the Matabiau train station (using the Metro – Line B) as well as from the Toulouse-Blagnac airport (using the Toulouse ring road). The nearby Metro station “Minimes – Claude Nougaro” will provide fast and convenient access to the historic centre of Toulouse as well as to the various business venues in the core of the City Centre. Stopover Discovery Menu at 79.50 euros, with appetizer + course or course + desert. Stopover Gourmet Menu at 84.50 euros, with appetizer + course + desert. At the end of the second motorway keep going straight ahead towards Bordeaux/Albi until you reach a roundabout, (do not take the direction signposted to Toulouse Centre ),then follow « Les Minimes » straight on (above the ring road) . See « Going to Les Minimes » below. Going to « Les Minimes » : Follow the ‘Les Minimes’ directions at the next 3 junctions. At the roundabout called « La Barrière de Paris », facing the supermarket Casino, turn right on the Avenue des Minimes towards the City Centre. Should you wish to visit Toulouse or enjoy an evening out, the Alizé Hotel staff will be happy to advise you according to your tastes and requirements. Maps of Toulouse and its surroundings, as well as lists of restaurants and shows are available at the reception desk. Historically named the “Pink City” (due to the colour of its brick walls and red tiled roofs) or the “City of Violets” (referring to the abundance of these blooms growing throughout the region), Toulouse boasts a world renowned Aeronautics and Space Industry; it is the base for many high tech companies and second only to Paris as the most important university city in France. Toulouse is a dynamic city offering a wide range of cultural, sporting and historical experiences and is the perfect place to celebrate your special events.